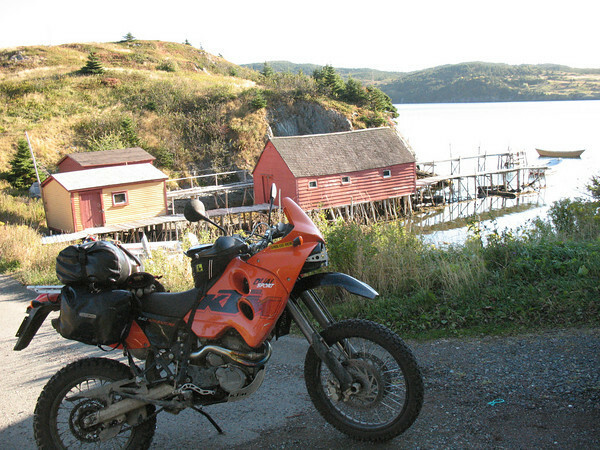 Mike Buehler is a two wheel fan from Portugal Cove, Newfoundland. He's been riding motorcycles for 15 years and pedally bikes for many many more. He earns a living as an Industrial Rope Access Technician and can currently be found hanging off of wind turbines in Pennsylvania. If you can find him at home he's usually riding something fun. This past year I endured a riding season with far less bike time than I wanted. My lack of riding time was largely due to a busy job schedule that kept me far from home for much of the year. I even had to pass up a 10 day trip to Labrador that a buddy and I had planned for months! When I got a call from work in late October saying that I’d be heading to Nova Scotia for another job at the end of the week, I knew I wouldn’t get much more riding in if I didn’t plan something, and quick! The time to make a break was now, so I lifted my spirits and got on with the planning. I had been a little down, due to the lack of riding, and almost as if to rub salt in the wound, a speeding ticket on Thanksgiving the week before. Up to 6 points now! So it’s Tuesday and I was scheduled to fly on the weekend, what to do? My time constraints were many, between having to take some time to care for my mom's animals while she was away, and making sure I was home in time to pack and catch a flight, all the while dodging the less than ideal weather we'd been having. The week before, my friend Geoff posted an invitation to make a run to Tides Cove Point down on the Burin Peninsula, about 350 km from St. John's but it might be less from my house? Which got me thinking that I hadn’t really been lighthouse hunting since May and he'd probably given up on anyone still playing the lighthouse photo game and thought he’d walk away with the trophy. Not if I could help it! So I started hatching another ‘hare’ run plan to balance Geoff’s ‘tortoise’ approach all season. I wondered how many lighthouses I could photograph? If I rode down the Burin Peninsula I could grab Tides Cove Point, St. Lawrence Head, the same 3 lighthouses that Geoff and Bill visited on the west side of the peninsula and just maybe I'd get lucky and Burin Island would be visible from shore? From there I'd boot up to Bay L'Argent, catch the southern coast boat over to Poole's Cove and grab Belleoram and English Harbour West while hoping to see St. Jaques Island too. Twillingate maybe? A long run home but doable if all of the cards were in my favour. Getting my bike out of the basement by myself proved to be a treat! There’s a short ramp, to one tall step up the inside, to one step down and four steps up the outside which is tricky enough that I had to run it out under power using some (what I thought were spoiled and solid) bags of concrete powder as makeshift steps inside. I did manage to extricate the bike from its resting place after a short and painful struggle that sent concrete powder flying. A bit of concrete powder cleanup and wincing through the pain of a charley horse, just above my right knee, and I'd be ready. The charley horse was from the footpeg hitting me on a rollback during one failed attempt. But of course I still needed to look after a few more details around the house… after the usual delays, chats, and packing I was finally good to roll out at 3:30 pm. Hmmm...Can I still pull this off with such a late start? I detest the Department of Motor Vehicle point system, and having to let my speedometer and fear of speeding tickets dictate my pace rather than the road! I was determined to have fun despite my lack of pace. On the road down highway 80 all the way back to the Trans Canada, west as far as Goobies to catch 210 south towards Marystown. After riding very close to the speed limit the whole way I rolled into the town of Burin at late dusk, around 7 pm. I took a brief spin around town with my eyes open for Little Burin Island, but with no luck, I rode on to Fox Cove and then out the Tides Cove Road to capture my first lighthouse of the trip. All the while, I was hoping to see a spot where I could pitch my tent in relative privacy and comfort. In the dark, I arrived at the first lighthouse and spent a little time searching for a piece of flat ground. I settled on a spot with just enough level grass beside the helicopter pad. I was a little sheltered from the wind and below the ever present revolving light. Yay! I checked my phone for coverage, still a few bars, and with that small blessing I made the appropriate "I'm safe and sound" calls before settling in to pitch my tent and make some dinner & coffee. Rats! Here's where I realize most of the things I'd forgotten in my rush to get on the road: all of my eating utensils, my can opener, my book, of course my toothbrush and toothpaste, and my headlamp - it was still in my work bag, but I did remember to grab my raingear. I’m an idiot! I promptly came to the conclusion that I’d run off 'half cocked'. Fortunately I did remember a knife so I ‘made’ supper of cheese and salami and lamented not having a book. With nothing else to read I looked over my map, checked some distances and came to the conclusion that I'd probably need to be rolling by 6 am to have any hope of making the boat at 9:15 in the morning. With that I set my watch alarms for 5:30 am, 5:45 am, and 6 am to be able to check daylight. Bedtime 9:30 pm, sleep was mostly good, I still didn't need to zip up my sleeping bag, but every time I tossed & turned and tried to stretch my legs my charley horse woke me up a little more. Perfect! Not long after I took that shot the lighthouse keeper rolled up to unlock the gate below me and start his day; I said hi and he invited me in for a visit to which I replied that I would be happy to and would be there right after I packed up. Lighthouse keeper, Barry Hollet, drank a cup of coffee with me and gave a great history lesson about the lighthouses around the Burin Peninsula and where I could see the ones on islands from land. I left him with the news that one of my riding buddies might show up later in the day and a request not to give him (Geoff) any extra lighthouse information unless he specifically asked. Sorry Geoff, that was low of me, but I needed all the breaks I could get, ha ha ha, sneaky bugger! The road back into the town of Burin is fun and scenic with lots of small roads through tiny coves that bring you back to an earlier time when it was hard to eke out a living, but probably a lot less complicated than today in many ways. Then it was back onto the main road route 220 towards Little Burin, St. Lawrence Head, then on around the bottom of the peninsula. 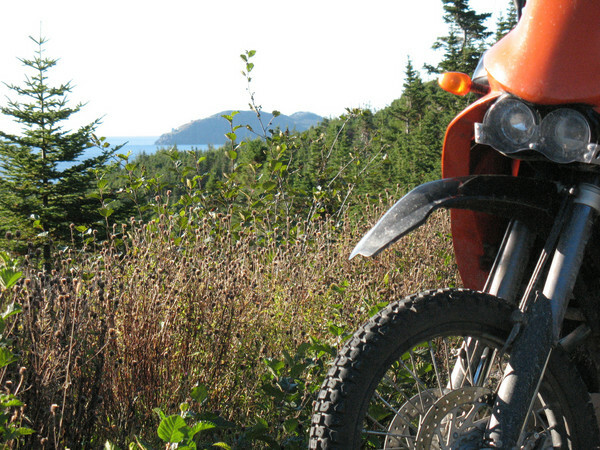 My map showed a secondary road between Lawn and Lord's Cove right off of the main road that I was already on; it was nearer the water and proved to be a scenic and pleasurable ride on my dual sport. Most street bikes would not be suitable for riding on this section due to the poor condition of the road. It was full of very loose dirt/gravel and plenty of large eroded rain ruts. Barry, the friendly lighthouse keeper, had another surprise for me, which was the scoop on Allan's Island lighthouse that I knew nothing about. There are a number of lighthouses that are not identified on the lighthouse link Geoff had posted on our web forum. 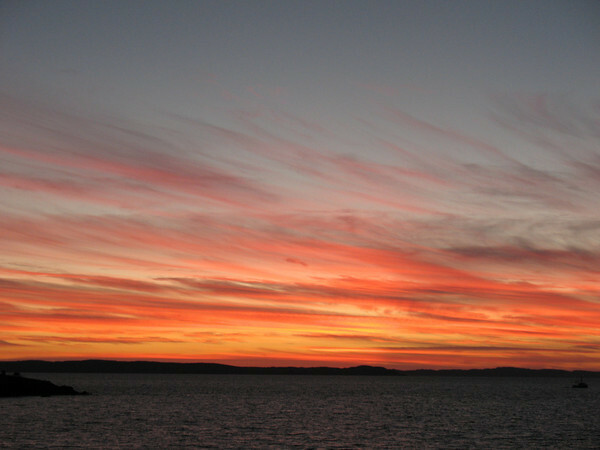 Another good resource is the government of Canada, Fisheries and Ocean's website (see end of story for link) where you can access the current Newfoundland and Labrador list of navigational signals and lights. There is usually a brief description that will tell you what kind of structure it is. Be forewarned that you will need a decent map to go along with it and will still have a tricky time figuring out what’s worth riding to for the photo value, unless of course you just want to ride. I met Peter, the Allan’s Island lighthouse keeper, halfway out the road on his way to lunch. I was sorry I didn't get to look around inside his freshly painted premises. Barry told me where I could see Little Burin Island light and Green Island light from the road. I rode out as far as I could along a small spit of land and took a shot with the optical and digital zooms maxed out on my camera. The lighthouse was barely visible in the photo, but it still counted for a point in our game. Miquelon and its sister island St. Pierre are not well known, but they are very interesting in that they do not belong to Newfoundland, or for that matter, Canada, they belong to France. If you go there don’t forget your passport; it is a trip that is well worth the short passenger ferry ride just to experience the French culture and cuisine, and so close to home. Better check ahead to see if they allow bikes on the ferry from Fortune though. I rode through an ATV path along the shore to see if I could get a better shot of Green Island with St. Pierre in the background. I was pleasantly surprised at how my cheap Korean Shinko tires performed in all the rocky/wet/muddy/grassy terrain and how well the trusty KTM 640 Adventure performed off road even with my bags loaded with gear. It’s another 10 kilometer dirt road ride out to Fortune Head where I stopped for a quick chat with Gordon Price, the lighthouse keeper there; all the time amazed that there were lighthouse keepers still manning their posts out here. 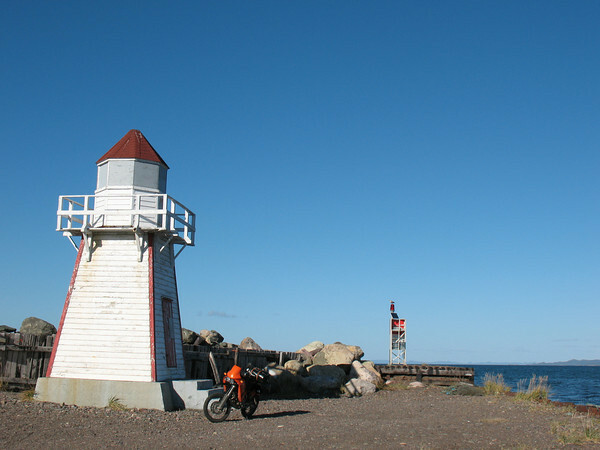 Grand Bank lighthouse is the easiest lighthouse to get to anywhere that I can think of: it sits on the end of the town wharf. 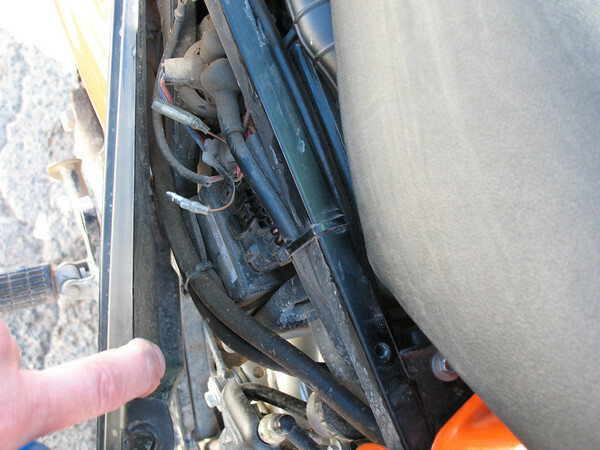 I was't surprised to find that nobody sells premium gas in Grand Bank so I pulled up to a pump at the local gas station and took off my bags, the seat, and then a side cover to get at the little wire I needed to unplug to change the fuel map for low octane. Sigh. You’d think they’d make it a little easier on a bike designed for riding far off the beaten path wouldn’t you? The little wire above my finger is the one in question. Garnish lighthouse is nothing special to look at and apparently was built by the community more for scenic rather than safety value. In our game it still counts because you can climb up in there if you wanted to (at least I think those are the rules?). It was 3:30 pm and time to head home. My little lighthouse run was far more successful than I expected when I got up that morning - 8 lighthouses! I had no regrets about the change of plans. I think the boat route would be a nice one to take to Harbour Breton for the ‘Come Home Year’ celebrations scheduled for late July 2008 (I’ve been told I’m going and that it’s going to be quite the party!). Sunset over a fishing boat near Heart's Delight on route 80 and still close to an hour from my house. Not long after I took this shot I was in pretty much in full darkness near Heart's Desire when my low fuel light came on after just 344 km – at least 50 less than usual! When I reached down to switch over to reserve I found to my horror that I'd forgotten to switch it back in Grand Bank! Anxiously, I tucked down behind the fairing and thought nice thoughts all the way into the gas station in Heart's Content, whew! Recharged and not feeling too awfully cold I enjoyed the last 30 km to New Melbourne. I arrived at 7:30 pm and the temperature was 0º C and I happily put the bike back in the basement with much less effort than it took to get it out. It only took a 1/2 hour to drain down the pipes in my house so they wouldn’t freeze, unpack the bike and hit the road to St. John's. Six minutes shy of 36 hours after leaving mom’s house in Portugal Cove I rolled back down the same driveway at 10:06 pm with 366 km on my car odometer. Of course I forgot to look at the odometer at home but it showed 900 km in Heart's Content for a round trip of 930 km on my bike and a total of about 1300 km of driving in a day and a half. Yes, I stayed very close to the speed limit for just about all of it. My final task was to get on a computer and see if Geoff had also made the run to Tides Cove Point? Then of course I had to post my own ride report to throw out the new tally. In May I rode 3,500 km when I made the first bid to beat my fellow members in the start of the lighthouse photo trophy game. In the 5 months following May I only managed to put on another 3,500 km total and Geoff took a substantial lead against all comers. This little jaunt gave me 8 more points and tied me for the lead, our tie and the tie for second place made the decision to continue the fun next season a no brainer! - Canada Fisheries and Ocean's website. Want to check out Part I of this article? Here's the link to Part I - Into the Light. I am always drawn to riding destinations that offer a mix of history, scenic views, interesting structures or buildings, and include an element of challenge to reach. 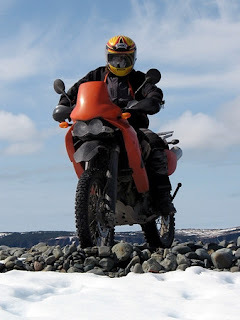 Early in the 2007 riding season, I suggested to a group of my adventure riding buddies that it might be a lot of fun to all take part in a friendly competition of sorts. 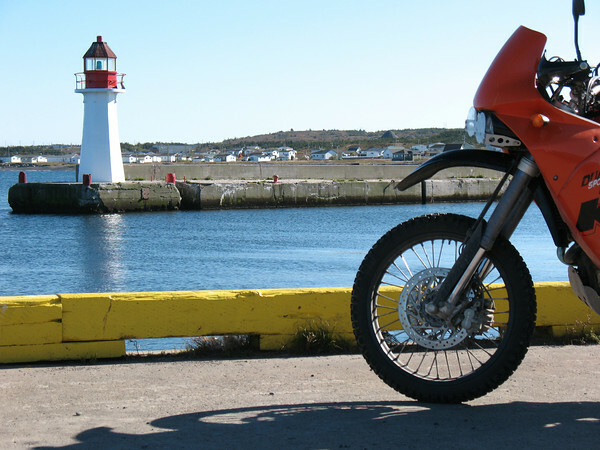 My idea was based around the premise that the historic lighthouses of Newfoundland & Labrador, are perfect destinations for bikers who share my idea of what a great adventure ride must include. 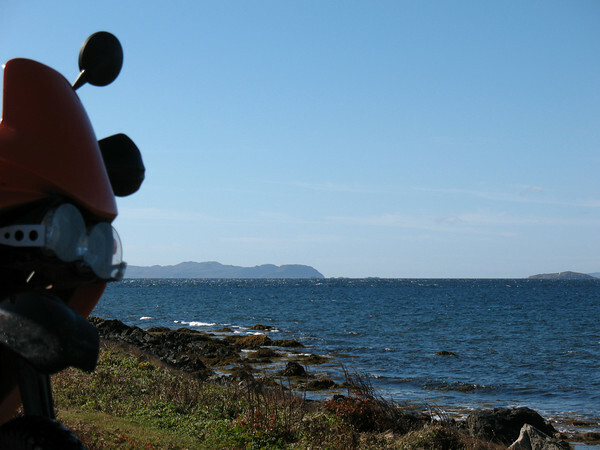 The plan was to see who could shoot the most photos of their bikes with Newfoundland or Labrador lighthouses, during 2007. Each participant would score one point for each ‘lighthouse trophy photo’, and the winner would be crowned at the end of the year. We posted the idea on our local NL adventure riding web forum (ridetherock.com), and many riders immediately began posting their photos within our photo contest thread. I must admit that I became very addicted to planning rides around the island, based on the locations of lighthouses that I wanted to visit and photograph. 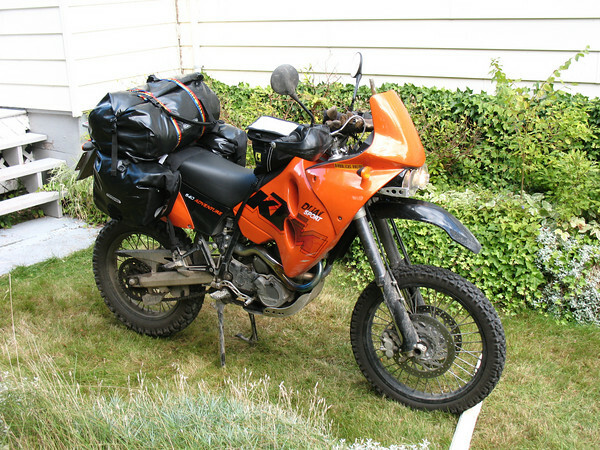 Some I would travel to on my Suzuki DL650 V-Strom and others on my Suzuki DRZ400S. Pretty soon there was some very heated competition among our ranks, with clusters of riders all holding similar numbers of points in our game. My good friend Mike Buehler became my ‘arch enemy’ in the game. Mike and I pulled out to the front of the pack early in the riding season, and continued to have close scores throughout the year. Sometimes Mike and I would ride to lighthouse locations together, to gain a point each. I think we’d both admit that we had the most fun when we’d visit our web forum, only to find out the other guy had once again moved ahead in the points, without our knowledge. The combination of the friendly competitive nature of the game, and the joy of exploring remote areas of our province’s coastal regions, was an intoxicating combination for a couple of guys who are basically just forty-something kids at heart. 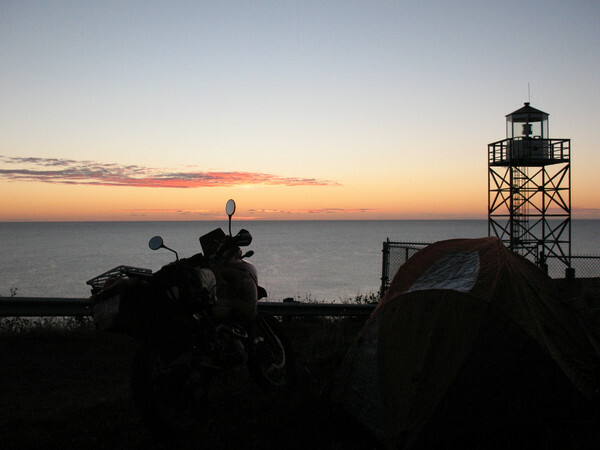 I don’t think I’d ever laughed so hard, as the time I rode to a remote lighthouse on the Burin Peninsula, known as ‘Tides Cove Point’. The lighthouse keeper’s first words to me were “Another one of you guys? 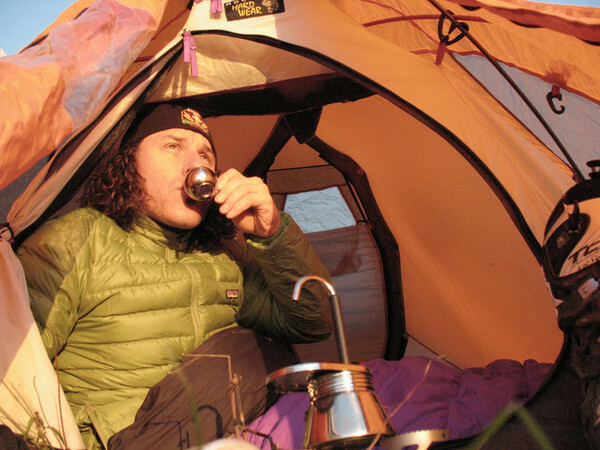 !...That’s two in one day.” Further discussions with the friendly lighthouse keeper, revealed that Mike had visited the very same location the night before, pitched a tent, and had coffee with the lighthouse keeper that same morning. Another reason why I like the idea of capturing images of Newfoundland and Labrador lighthouses is that they are a dying breed, so to speak. New, more efficient, and less expensive technologies are replacing the historic navigational structures which once stood proudly all along the coastal regions of the world. Our region is no exception, with many of our lighthouses replaced by small but powerful navigational lights, mounted upon steel skeletal towers. In some cases the older structures have fallen into a state of disrepair and neglect, and in other cases the points of land where they were originally erected have been eroded away by the pounding seas around them. The Cape Race lighthouse is the tallest on the Island of Newfoundland; it sits on the most south-easterly point in the province. 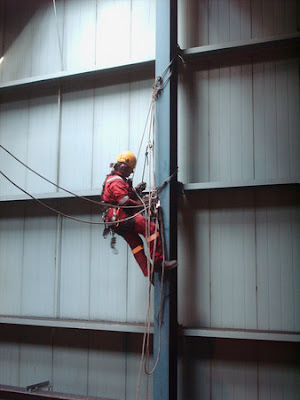 Standing 29 metres tall (96ft. ), it uses one of the three largest hyperradiant fresnel lens arrays every made. The lens was crafted by the Chance Brothers of Birmingham, England, in the late 1800s, and rotates floating in a bath of liquid mercury. 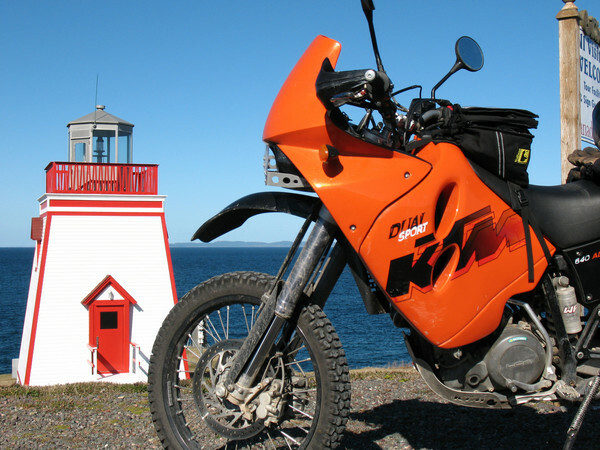 To get to the Cape Race lighthouse a rider is required to navigate a rough 20 km dirt road, accessible from the community of Portugal Cove South, from Route 10 on the Avalon Peninsula. This same dirt road will take you past one of the most prolific and ancient fossil discoveries in the world, at a location along the coast known as ‘Mistaken Point’. Mistaken Point is so named because of the navigational hazard it poses to sea going vessels at the often-foggy southeastern tip of Newfoundland's Avalon Peninsula. It’s also an ecological reserve where you can see examples of the oldest complex life forms found anywhere on Earth. An entire story could be written on this site alone but I’ll save the additional research for you and give you a link at the end of the story. The Cape Pine lighthouse is the most southerly lighthouse on the Island of Newfoundland. The winds are so strong in this area, that the lighthouse and adjoining buildings have been designated as unfit for human habitation. 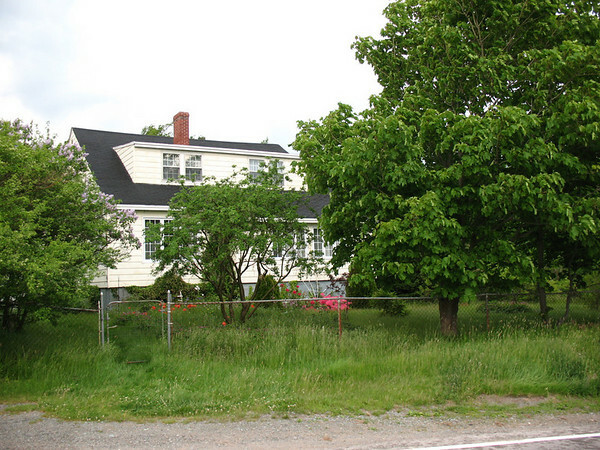 The Cape Pine lighthouse can be reached from Route 10, then from a very rough dirt road that branches off the main dirt road, leading to the community of St. Shotts. The Cape Spear lighthouse is the most easterly in all of North America. The tides and undertow currents are so powerful in this area that several unlucky people are washed off the rocks and drown in the surrounding waters each year, despite the many posted warning signs. Best not to let your curiosity get the better of you when you visit. The Cape Spear lighthouse can be reached from Route 11. 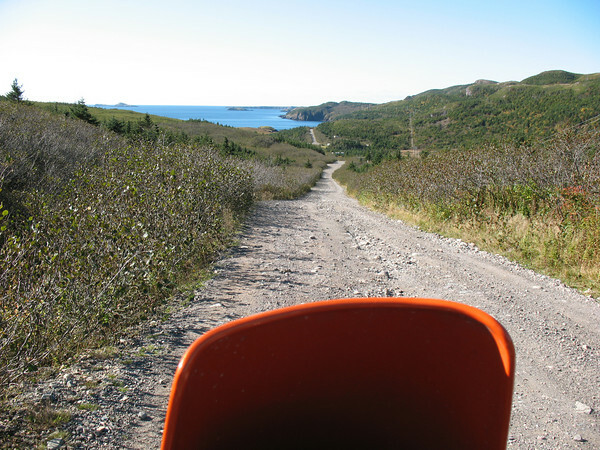 Access is via paved roads all the way to the Cape Spear Park area. The older, now defunct, lighthouse still stands on the hill behind its more modern cousin. The Bull Head lighthouse is one of the more inaccessible lighthouses on the East Coast. You would be wise not to try to ride up the trail to this location, unless you have knobby tires, a lightweight dual sport, or an off road motorcycle, and a fair amount of technical off road riding experience. The trail leading to the Bull Head lighthouse can be reached from the community of Bay Bulls, which lies along Route 10. The Ferryland Head lighthouse is near the “Colony of Avalon” archaeological site (one of the earliest European colonies in North America), and requires the rider to navigate a fairly technical trail. There is a dirt parking lot about halfway along the trail, where most four wheel traffic must stop to avoid the steep climb up a very narrow section of the trail. This section drops off steeply toward the ocean below on both sides. Leaving your bike at the parking lot may be wise, unless you have respectable rocky trail riding skills. There is a unique dining experience available once you reach the Ferryland Head lighthouse. A fine dining ‘picnic’ is served to patrons on blankets, among the grasses and wildflowers which surround the lighthouse. A very unique and enjoyable dining experience awaits those who book a ‘blanket’. The Ferryland Head lighthouse can be reached from Route 10. 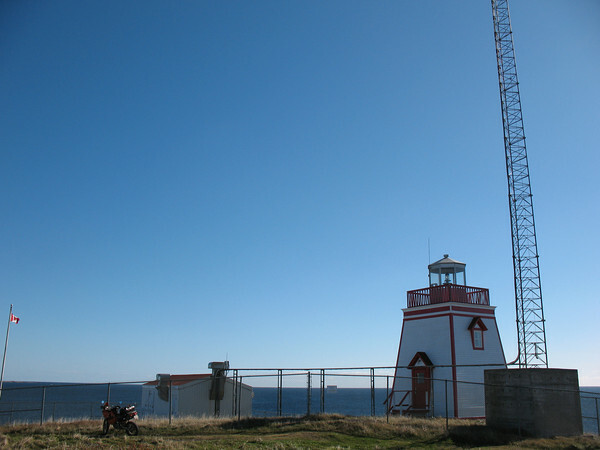 Cape Bonavista lighthouse is one of the most easily accessed on the tour so far, and has the added benefit of requiring you to ride through one of the most scenic regions of the province to get there. A replica of Cabot’s ship ‘The Matthew’, now sits docked in nearby Bonavista Harbour. This beautiful square-rigged vessel made a commemorative journey from Bristol England to the town of Bonavista, in 1997. 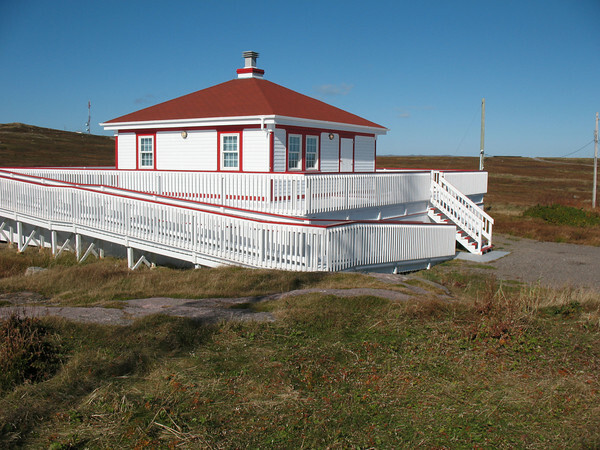 Cape Bonavista lighthouse can be reached by taking Route 230 to Route 235 and continuing all the way to its end. By the end of 2007, twenty people had participated in our lighthouse trophy photo game. Mike and I ended up tied for first place, with 30 lighthouse trophy photos each to our credit. Coincidentally, the second place finishers (Doug and Jamie) were also locked in a dead-heat tie, with 14 points each. We had riders participate who had traveled to Newfoundland from as far away as Toronto Ontario and the state of Indiana. In light of the fact that the first and second place finishers ended up locked in a tie, we decided not to announce a winner in 2007. We decided we would instead extend the game for at least another year. This seemed to be a good idea also, based on how much fun we all had with the game during the year. Why put an end to a good thing? I fully expect to revisit the pleasure of logging on to my local online adventure riding web forum during 2008, only to find many more posted photos of my arch enemy (Mike) and his trusty bright orange KTM 640 Adventure, as he poses in front of more remote lighthouses with a satisfied Cheshire grin on his face. I will accept that dropped gauntlet as a challenge to hop on my V-Strom and seek out as many more lighthouses as I can find, with my camera close at hand. For a more detailed look at the history of the lighthouses of Newfoundland & Labrador, the specific details of the structures, and directions to find the many dozens of lighthouses strung all along the rugged coastline of our region, I recommend this online educational resource. 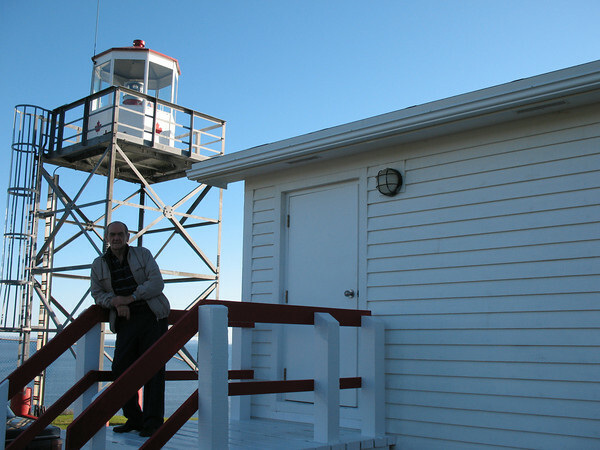 It was invaluable to me as I researched and investigated the lighthouses of my home province. - Cape Race Hyper-Radiant Fresnel Lens info can be found here. - Mistaken Point Ecological Reserve information can be found here. - The Colony of Avalon website can be found here. - Ride the Rock website. Be sure to catch next week's follow up first person account from Geoff's key competitor Mike Buehler!